Families with younger children or pets always need to make special considerations when planning a patio, swimming pool or landscaping for their backyards. However, this need for ensuring safety, enjoyment and as little work as possible for those in charge of cleaning and maintaining the yard also extends to childcare providers, grandparents, aunts, uncles and other family members who have homes frequently visited by children. While homeowners with no children or adult children may not initially consider these needs when creating a landscaping plan, it is safer and more convenient for all parties if they plan ahead to prevent slips and falls, damage from spills, and other unfortunate or costly mishaps. This is, of course, also true for pet owners or homeowners who often have the pets of friends or family members in their yards. Safety is a top concern for childcare providers, parents and others who often have children in their homes. When small children are going to be in our homes, we remove sharp objects, cover electrical plugs, eliminate tripping hazards and relocate valuable items that may not survive a visit from an active child. We also take steps to prevent spills, add non-skid strips to bathtubs and place gates in doorways to keep kids out of more dangerous areas. However, this level of concern for safety seems to be primarily reserved for inside the home and is much less common when planning outdoor areas. The general consensus seems to be that outdoor play is inevitably a more injurious venture for both the children and our yards where scraped knees and nosebleeds can be expected, spills and stains are unavoidable, and damage to both the players and the play area are inescapable. While it is true that creating a kid-friendly yard with safety in mind is not going to allow you to avoid every skinned elbow or stubbed toe, steps can be taken to prevent injuries as much as possible and to keep your patio or yard from receiving costly or irreparable damage. Many states have laws governing pool enclosures and the mandatory use of drowning prevention safety features. For example, the State of California’s Swimming Pool Safety Act gives homeowners seven options for safety features, one of which must be used when installing a new pool or renovating an existing pool on their property. This law is designed to decrease drowning rates by limiting direct access between the home and the swimming pool, making it more difficult for younger children to gain entrance to the pool area without supervision. Creating a fenced enclosure is just one of the options on the list of approved safety features; however, it may be the most effective in some situations. For example, door alarms that alert you when a child leaves the house are useful, but they are not helpful in drowning prevention if the children are already outside enjoying a backyard playground or helping a parent in the garden. Placing a fence between the swimming pool and other areas of your yard allows your children to enjoy other features, such as a patio area, playground, putting green or basketball court while you can rest assured that they will stay a safe distance from the pool or spa. 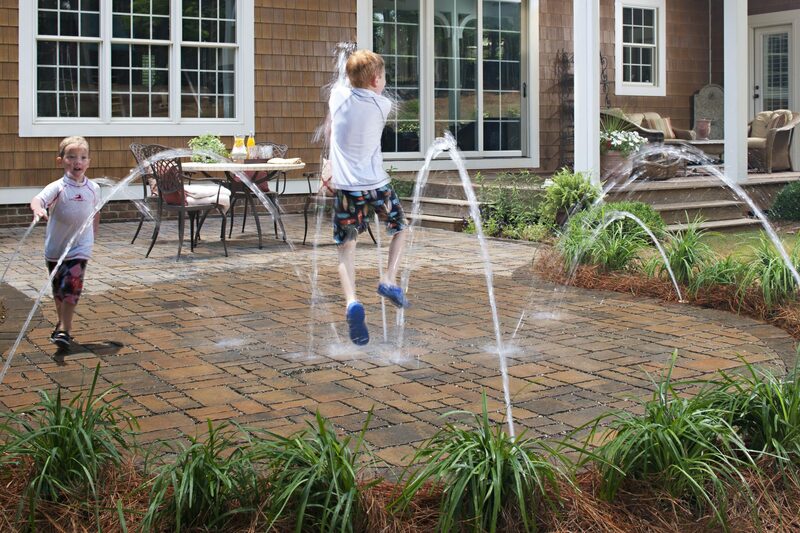 Patio areas, walkways and swimming pool decks are prime locations for children to slip, trip and fall, and some hardscape surfaces do little to help prevent this. Consider using non-skid, non-slip surfaces, such as pavers, wherever children are likely to run and play, particularly in areas where the surface is likely to get wet. While you might not be able to prevent every accident that can occur on hard surfaces in your backyard, you can limit injuries by installing non-slip options that help keep kids from falling. Also keep in mind that scraped knees are not the only issue of concern around pools, spas and other water features, there is also the potential for a child to slip and fall into the water, which should obviously be avoided as much as possible. It might be tempting to fill your flower beds with azaleas, calla lilies or daffodils, but these – and many other common plants – can be toxic to children and are better left to be enjoyed in areas where kids do not play. This includes many beautiful berry-producing plants that are commonly used in landscaping, such as mistletoe and holly bushes. You may also want to avoid prickly landscaping options like cactus, agave and sago palms. These are often sought after for their unique look and high tolerance regarding drought and soil type; however, the possibility of a child falling into one of these prickly plants or little hands taking hold before realizing just how sharp they are makes this type of landscaping option best avoided in areas frequented by children and pets. There are several reasons that artificial turf is considered a safer option than natural grass for backyard play areas. First, synthetic grass lawns provide an even, uniform surface that results in fewer trips and falls when compared to the often uneven surfaces of natural grass lawns. When properly installed, fake grass also generally offers a softer surface on which to fall when accidents do happen. For example, when walking on an artificial grass lawn with proper infill, you will notice that each step feels like you are walking on a soft, comfortable, cushioned surface. If your children share your backyard with your family dogs, artificial grass provides the additional benefit of allowing pet urine to drain through the fibers to the ground below, lowering the potential for your children to come in contact with animal urine as they wrestle, roll and play on the grass. It should also be noted that pet droppings can be easily scooped off of synthetic turf, and fake grass can be easily cleaned of liquid pet waste with nothing more than your garden hose. In addition, artificial turf does not require pesticides, herbicides or fertilizers, which allows you to limit your children’s (and pet’s) exposure to harmful chemicals. Safety is a top concern wherever children will play; however, you also want to consider landscaping options that will help you avoid costly repairs, make cleanup as simple as possible and limit the need for time-consuming maintenance. Fortunately, some of the same landscaping options that provide enhanced safety for a kid-friendly yard also make it easier on the adults when it comes to cleaning up spills, repairing damage or preventing costly repairs. For example, artificial turf is a great choice for increased safety, and it is also easier to clean and maintain than natural grass. There is no need for mowing, weeding, fertilizing, spraying pesticides or taking on other time-consuming chores associated with maintaining a natural grass lawn, which makes this easy-care option ideal for homeowners. If spills occur, they can most often simply be rinsed off with a hose, and if a section of your synthetic lawn is somehow damaged, it can always be patched up by a professional quickly and affordably. It is also ideal for a pet-friendly yard, particularly regarding the simplicity of cleaning up solid and liquid pet waste. Another example of a safety feature that also makes yard maintenance easier and more convenient is a swimming pool fence. When your pool, spa and other water features are safely secured behind a fence, it is far less likely that mud pies lovingly crafted by little hands, wheelbarrows full of leaves, costumes from the dress-up chest or diapers sneakily removed to allow for enhanced agility will end up in your pool or pool filter. Aside from being non-skid and non-slip, pavers are also a kid-friendly landscaping option due to their ability to be zipped together and unzipped – much like Legos – which means a single paver damaged by a resistant spill or accident can be removed and replaced without the need to repair an entire section or your entire patio or walkway. The end result after replacing just one, two or a few pavers will look seamless and as though nothing had happened to your patio, which is not an option with traditional concrete slabs or other hardscape solutions. Parents, grandparents and childcare providers are likely going to be most concerned with safety and maintenance when designing a kid-friendly yard; however, it is also important to include features that will appeal to children and make your yard a desirable destination for the young and young at heart. There are always the typical options from which to draw inspiration, including traditional playground equipment, wading pools or sandboxes, but you also want your backyard to be enjoyable for adults, which means combining the needs of varying age groups that will be using the space. Creating an attractive space that provides fun play areas for children without looking like a park playground requires a bit of extra creativity and planning but is entirely possible. Whether it is behind a grove of trees or tucked between hedges, a secret garden provides the perfect play area that can become a fort, a castle garden or a fairy hideaway in a child’s imagination. If you have a child who loves to read or prefers solitary play, a secret area tucked away just for him or her to enjoy is sure to bring a smile to your little one’s face. After the children are tucked in bed, you can easily transform this area into a romantic retreat by lighting a few lanterns or bringing out your cozy chair cushions. Birdhouses might be the more popular option in most backyards, but your kids will think you are the coolest parents on the block if you opt for bat houses instead. These inconspicuous boxes can be placed in trees around your yard to welcome bats to stop by and stay a while. Not only will your children be able to watch the bats fly around in the early evening, your yard will instantly benefit from some all-natural insect control. Plant flowers that add color and fragrance, while attracting wildlife. Butterflies love fragrant flowers, and hummingbirds are sure to frequent yards with colorful blooms, so you can create a backyard that appeals to both by planting flowers that will add both inviting color and welcoming fragrances to your landscape design. Your adult guests will enjoy the vibrant hues, while the children will delight in watching hummingbirds and sneaking up on butterflies to get a better look. 4. Plant a children’s garden. Planting a garden with your children is a great way to teach them about nature, where food comes from and how to take care of living things. If you plant a few vegetables that are easy to care for and are on the list of your children’s favorite foods, they can enjoy spending time with you as they learn valuable lessons and watch these foods go from tiny seeds to the vegetables on their plate. If you are one of the many parents who struggle to convince your kids to eat vegetables, you might find that they will have a renewed interest in fresh produce when they have grown it themselves. You can make this small garden patch part of your larger garden to provide a special area for your kids while you grow a wider variety of foods to feed your family. Creating a kid-friendly backyard takes a bit of planning, but the time and effort put towards creating safe, easy-to-care-for play areas is well worth it. The benefits of having a yard designed with kids in mind will be readily apparent as you watch your children enjoy spaces dedicated just for them while you enjoy the advantages of convenient cleanup and the need for fewer Band-Aids. Do you have any more tips to add?